This glamorous Forever Classic band showcases thirteen 1.8mm melee moissanite gemstones. 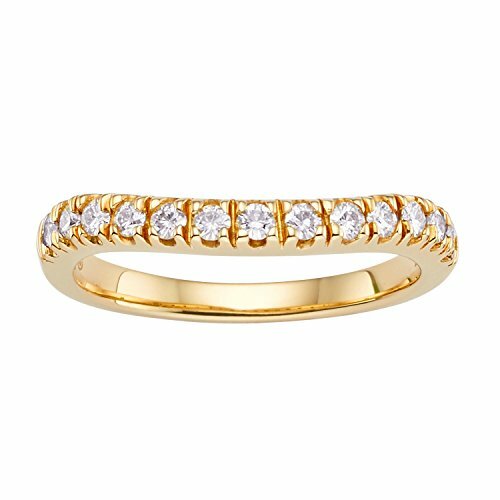 Beautifully crafted in 14K yellow gold and secured in a four prong setting. Ring size 6. The total Diamond Equivalent Weight (DEW) is 0.33cttw DEW (Actual Weight 0.28cttw). This glamorous Forever Classic band showcases thirteen 1.8mm melee moissanite gemstones. Beautifully crafted in 14K yellow gold and secured in a four prong setting. Ring size 6. The total Diamond Equivalent Weight (DEW) is 0.33cttw DEW (Actual Weight 0.28cttw).